I finally got tired of the terrible performance of my Acer Aspire 3680-2682 model laptop. It was a cheap bottom end machine when it was purchased and it has not aged well. Thankfully I found out that you can do more than just the typical laptop RAM and HDD upgrades on this machine. In fact, unlike most laptops you can replace the single core Celeron CPU with a higher clocked, higher performance Core 2 Duo processor. So I decided to get myself an early present for the holidays and get a few cost-effective upgrades to speed up this old laptop and extend its useable life span for a few more years. I had already switched from Ubuntu to Lubuntu for some RAM savings, and while that and the improvements made in Firefox 7 made the day to day experience of browsing with this laptop more tolerable it still wasn't very fast. If I had a mess of tabs open, as I often do these days, things slowed down a lot as the machine hit swap space. The limited RAM and the slow CPU meant that web apps crawled and local apps like GIMP didn't run much better. So, I started researching what upgrades were available for my specific model laptop, expecting to be limited to adding more RAM and getting a new hard drive. Imagine my surprise when I found out you could actually replace the CPU with a much faster Core 2 Duo! There are some caveats and not every version of the 3680-2682 can take the same CPU upgrade I got, it depends on the motherboard the machine has. Fortunately you can swap that out too, but supplies on eBay seem limited and the prices are accordingly high for such an old model motherboard. I'm getting ahead of myself though. The first thing you want to do is make sure the BIOS is at version 1.3505 or higher, since that will enable you to drop in a Core 2 cpu. I was lucky to have a machine with that version already installed. I didn't want to have to partition and install Windows XP to be able to run the Acer BIOS update software, and I definitely prefer not messing with BIOS updates on machines that don't have dual chips like my ASUS desktop mobo does. The risk of bricking my laptop scares me, even though I rationally know that the risk is small. The next thing to do is figure out what motherboard chipset you have and see what processor you can upgrade to, based on that chipset. This is the limiting factor for the upgrades, depending on what mobo you have you could be limited to a Core 2 Solo CPU with 2 gigs of RAM, or you could upgrade all the way up to a Core 2 Duo T7600 with 4 gigs of 667 MHz RAM. I ended up with a mobo that was inbetween those, allowing me to get a Core 2 Duo (the T7200, which was much cheaper than the T7600s off eBay) but limiting me to 2 gigs of RAM without doing a complete mobo swap. To determine what motherboard version you have you'll need to remove the RAM cover slot and read the code on a sticker. That will tell you if you have a 940, 943, or 945 GML chipset. Mine was the MB.AZL06, limiting me to 2 gigs of RAM but allowing me to get a Core 2 Duo, unlike the MB.TEB06 which is limited to a Core 2 Solo apparently. The MB.TDX06 is the best one to have, as it'll let you buy your pick of Core 2 Duo CPUs and get a full 4 gigs of RAM. That's the mobo chipset you want to get if you decide to do a full motherboard replacement. Check out this thread for more info. It's a lengthy one so register for the site and use the thread search function if you have specific things to lookup. If you get confused by some of the confusion in the thread about what CPU you can get, read this post which should help clear things up. I also ordered a ~$70 Western Digital Black Edition 2.5 inch 7200 RPM 500 gig hard drive, choosing it over a ~$100 64 gig SSD for the size advantage and cost savings. I expected a high density 7200 rpm drive would still provide a noticable speed boost over the old 80 gig 5400 rpm drive this machine came with, and I was right. Boot and load times are noticeably quicker. It's no SSD, but I prefer the greater storage capacity and lower cost. I also still harbor some concerns about SSD durability. When prices drop and capacities increase greatly, then I'll consider moving over to an SSD. The other reason I didn't want to get an SSD for this laptop is that I can't afford one for my desktop at this time, and I didn't want my desktop to become my "slow" machine! People who use SSDs say they can't go back to conventional drives, I didn't want to end up replacing every OS drive on all my computers with an SSD. My wallet just can't take the abuse of a high capacity Intel SSD. Anyways, back to the upgrades I did do on this laptop. I ordered a new 9 cell battery from some random company on Amazon, I hope this wasn't a waste of money but only time will tell. At least it's far cheaper than buying a new battery direct from Acer. I don't even know if Acer still makes batteries for this old model laptop anyway. So far it's got longer battery life than the battery I was using, but that one was far past the point it should have been replaced so I can't really determine if this new one is better. While I could have bought a new model motherboard for this system to get a full 4 gigs of RAM I decided that wasn't worth the cost at this time and just ordered 2 gigs of 667 MHz DDR2 RAM, the max the motherboard I have already can support. This was actually a dollar cheaper than buying 553 MHz DDR2 SO-DIMMS, although my motherboard can only run the RAM at 553 MHz anyway. The benefits of a Core 2 over the Celeron M aren't limited to performance alone. Power savings are supposed to be noticable compared to the Celeron M, which lacks SpeedStep for dynamic underclocking and undervolting. Everything runs cooler as well. It's actually possible to use this machine on my lap if I want to now, since it's not as hot as it was before. The total cost of the parts I purchased was 180.91, less than even a basic netbook costs. I expect I'll be able to use this laptop for at least another 3 years thanks to these upgrades. It'll never be a gaming machine, for anything beyond old games and some indie games, but it's much more useable as a Firefox/GIMP/Eclipse/Gedit/Geany/Android Emulator/Actionscript Development box now. The first thing I did once all the parts arrived was finish up the work I'd been doing on the laptop and back up the hard drive contents to my 1TB external drive. My most important documents get saved to Dropbox automatically as well. I prepped for the upgrades by burning a new 32bit Lubuntu 11.10 install disc and getting out my tools and anti-static wrist strap. I went with 32bit Linux even though the CPU supports 64bit because of the RAM savings and because I only ordered 2 gigs. There's the Atheros WiFi card and modem! The RAM and battery replacements were the easiest things to do, the hard drive replacement was annoying because of course I had to copy all my data back over again, but other than that it was simple enough. The main difficulty of this upgrade was the CPU replacement, which required taking apart the whole laptop. If I had extra cash available (or if the mobo prices were not so high) and had realized ahead of time that replacing the CPU would require removing the motherboard completely from the case I would have gone ahead and swapped the board with the MB.TDX06 variant and gotten 4 gigs of RAM to go along with it. Taking apart the laptop completely to access the CPU was a bit nerve racking, as this is only the second laptop I have ever had to disassemble. 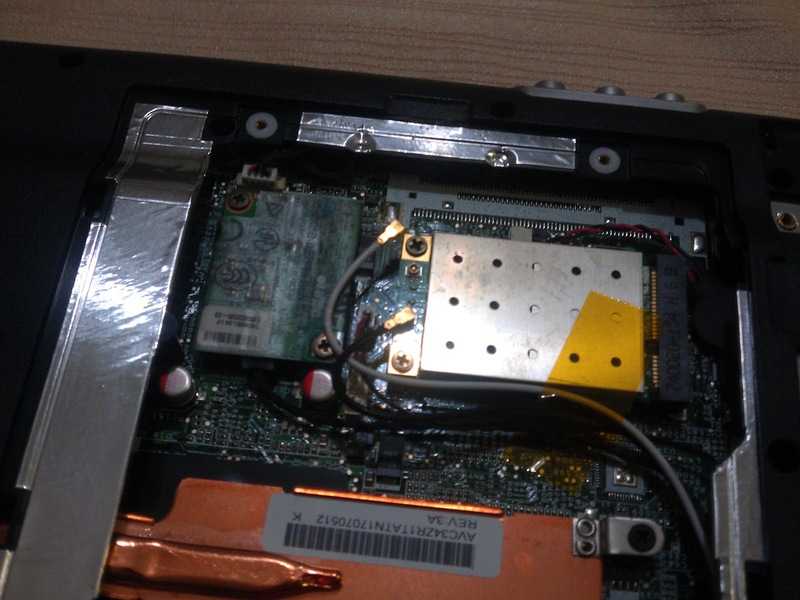 You'll want to watch this Youtube teardown video before taking everything apart yourself, but be aware that if you have an Acer Aspire 3680-2682 there WILL be screws that the video does not show. You'll have to be careful to not stress the circuit board while trying to take things apart when they're still screwed together. Go slow and steady, take pictures of everything you take apart, keep all the screws in one place sorted by size, make sure you remove all the screws that are holding things together by visually inspecting everything when the video tells you to remove a component, especially when told to seperate the top case from the bottom. There WILL be extra screws that are holding things together and you do not want to try ripping things apart when they're still screwed together. Use your nerd OCD and paranoia to do this right, not quick. I decided to do the most difficult upgrade first, replacing the CPU, and saving the RAM and HDD for when I had verified that the CPU worked. One of the CPU pins was bent, but I was able to (very carefully!) bend it back into position so that it fit in the CPU slot on the motherboard. The Artic Silver 5 thermal compound I bought was to replace the thermal gunk on the heatsink and CPU. I found some 70% isopropyl alchohol in the medicine cabinet to clean the old thermal compound off the heat sink in the laptop and off the used Core 2 Duo T7200. Make sure the CPU and heatsink are clean, dry and shiny before you apply the Artic Silver. Watch this if you need to see how to remove old thermal compound. I made sure to read the Artic Silver 5 application guide, since I've never used Artic Silver before. The last time I needed to attach a heatsink to anything was back when AMD supplied a thermal adhesive pad in the 939 Athlon 64 X2 days, so this was the first time I've bought any thermal compound. After doing the CPU upgrade and then rebuilding the laptop by putting everything back in place in reverse order you'll find that swapping out the RAM, HDD and battery are very simple in comparison. One problem I ran into in this process was that after I swapped out the old RAM with the new 2 gigs the system failed to boot. Testing revealed on of the new sticks was bad, and I had to get a replacement. The delay was annoying, but these things happen. Future upgrades will be a new backlight once the current LCD display dims down, as all such displays inevetiably do, and it's possible that at some point I'll pick up a model MB.TDX06 motherboard and 4 gigs of 667 MHz DDR2 RAM if I can get them cheap enough to extend the life of this machine further. So long as the total cost of the upgrades remains below the cost of a new laptop I think it's worthwhile. While I suppose I could have picked up a used newer model laptop with comparable specs for a hundred more than the cost of the upgrades, that wouldn't be worth the hassle of searching for a used machine that had Atheros wireless built-in along with other Linux friendly components. The cost of the upgrades was below the cost of even a new model netbook, and I know an Atom or AMD C-50 wouldn't compare well even with an older model Core 2. All in all, I think the CPU/RAM/HDD upgrades are well worth doing if you want to make your Acer 3680-2682 faster. It's not as expensive as a whole new machine and breathes a lot of life into your old hardware. Windows users can also look into mild overclocking with SetFSB. I wouldn't try anything too extreme with that though. I know I rambled on a bit with this post, but I hope I was detailed enough and pointed out enough helpful sites that someone else with a crap hand-me-down Acer Aspire 3680-2682 will be able to upgrade their laptop CPU and other components for a much nicer user experience and several more years of useable life. Cost-wise it sure beats buying a whole new system! Thanks for the great write-up. Going to install Mac os on my wife's 3680. Couldn't do it with the celeron processor. Should turn out to be a great computer. Question.... how did that battery end up working? The battery is decent but not amazing. I get over 3 hours of use in Linux these days if I turn the brightness down to half or so. I imagine it would do better in Windows, but haven't tested that. Let me know if your Mac OS X install works out well and consider writing a blog or forum post about it somewhere, I'm sure it'd be useful to people and you could link to it from here. I think that 3 hours is pretty good. The original battery lasts an hour if I'm lucky. Seriously though, your post was extremely informative. Thanks again! Finally got Snow Leopard 10.6.6 installed with everything else working on the computer. The OS did not like that hard drive, so I'll put it in my other laptop. This laptop is a real blazer with mac os, very surprising to see the speed compared to a windows base. Even my download speeds are doubled, very strange. I did have to exchange the wifi card with another one. Here is a small right up about my Snow Leopard install. This "Mac" is running better than I ever saw with Windows Vista. Good luck to all. Great instructions. Thanks. The T7200 costs $25 on eBay. The tear-down, replacement, and rebuild was 2.5 hrs. Processor speed in Win7 went from 3.5 to 5.0. And it seems noticeably snappier. Already had replaced the drive with an Intel X25 SSD, so I should be able to get a couple more years out of this laptop.